With our son turning 3 years old next month, my wife and I recently decided to brainstorm some ideas on how we could teach Benni to become more independent and self-determined. 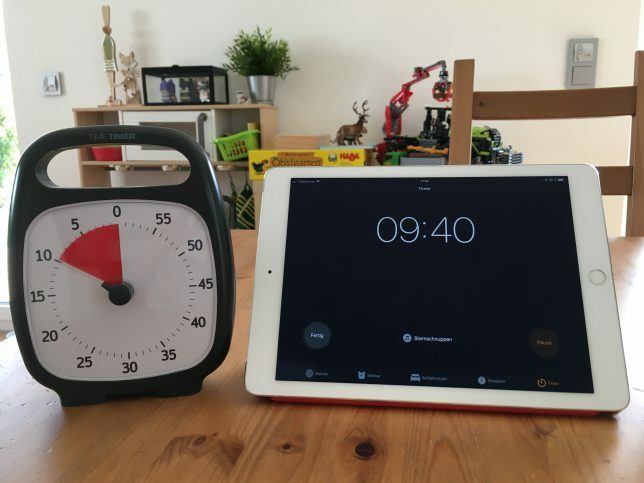 One of the most important things we came up with was the idea of teaching our son to understand the “concept” of time and the idea of setting time limits. And to respect them once agreed on. The “tool”, if you will, that we decided to purchase in order to achieve that goal is the Time Timer Plus. It is a visual countdown timer (more on this later) and a great countdown timer for kids. Bottom line: It works very well for us. 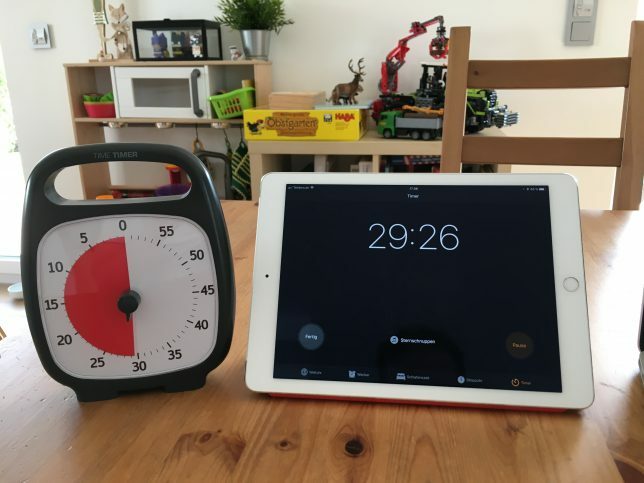 Let’s dig a bit deeper in this review and see if the Time Timer Plus is right for you and your kids as well, shall we? Now, wouldn’t it be great if you could ask them to go to their room and play by themselves for the next 30 minutes? Afterward, they can come back and you’ll be there for them. 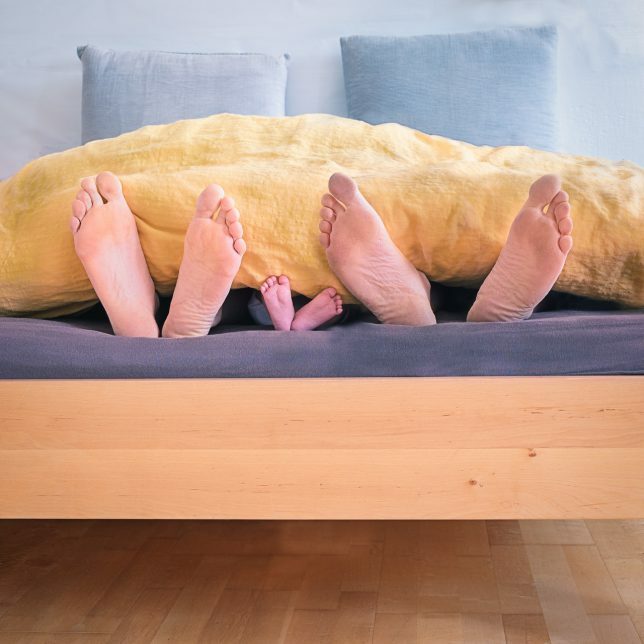 Having an agreement like that would allow you to get some rest and allow your kids to learn strategies to keep themselves entertained without the need of you as Mom or Dad being around all the time. Benni and I tried that a few times, but in the beginning, the obvious problem was that he simply had no idea how long 30 minutes where. We used digital timers in the beginning but it wasn’t until we introduced the visual Time Timer Plus that he started to get a grasp on the concept of “time span” (I’ll get to that in a minute). Benni loves watching “Die Sendung mit der Maus”, which is an educational TV show for children here in Germany. He also loves playing Super Mario Odyssey together with me on my Nintendo Switch. I can see why that is and I don’t think it’s a bad thing; as long as we parents are after it and make sure that our kids’ screen time does not exceed a certain amount, right? When we first started out allowing Benni to watch something on TV, there was a common pattern: He started watching, and after 20 minutes or so we would tell him that screen time is over now. Power struggles followed, and our son, obviously, had no idea why we would want to turn off the TV now? Why not in 10 minutes from now (and then again in 10 minutes from then etc. etc.). I bet you’ve been there!? Have you? Please let me know in the comments and share your story. I’m really eager to learn from you! That’s where the Time Timer Plus comes in very handy: When Benni wants to watch his favorite show or play a video game with me, I usually tell him upfront that he can have 20 minutes of screen time now; and afterward, we’ll turn the TV back off again. Then we set the timer. That way we have formed an agreement upfront. Usually, when the time runs up, I can remind him of said agreement. That way, we avoid unnecessary arguments, which is a blessing, really. What Is It That Sets the Time Timer Plus Apart from Other Countdown Timers? These two situations are just examples of why I think your kid and your entire family can really benefit from learning about time and time spans early on. For us, it worked incredibly well and helps us to avoid power struggles and arguments day in and day out. “Alright, that’s great! I have an iPhone, I’m gonna set a timer there and give it a try!” – Sure thing, you can do that. That’s what I did when I first started out with that idea and tried to give it a shot. I quickly noticed that a digital timer won’t cut it. That’s for a simple reason: Human beings are visual beings. What I mean by that is that by nature visual perception is our most important one. People learn best when they have some visual reference on the topic they’re trying to learn about, and, obviously, the same is true for our kids. Digital timers display numbers ONLY. That’s highly abstract and something most of our kids, especially at the age of 3, simply won’t understand. That is where the Time Timer Plus is so different: It doesn’t display any kind of abstract numbers (like digital timers do) or an abstract “pointer” (like normal analogue timers would) but instead shows a red disc, that really shows the AMOUNT of the remaining time: The more red is visible, the more time remains! … and 10 minutes remaining on both a digital timer and the Time Timer Plus. Which one would kids understand better? It’s simple, and it’s something kids can work with. It’s all visual, it’s easy to digest, it has a MEANING! And it is something that allows you to even discuss such an abstract concept like time with your child. That’s awesome! Who Is The Time Timer Plus For? I’m aiming a bit high here by saying: Purchasing the Time Timer Plus is an investment in your kid’s future. Please hear me out why I think that. As I explained above, the Time Timer Plus can be used to teach the concept of time to kids as young as just 3 years old. But it is also a tool that your kids can use later on in school. For example, they can use it to track agreements like “Please sit down for 30 minutes now to do your math homework. After that you can go outside.” or simply track progress. In fact, I am using it RIGHT NOW while writing this review here, in order to make sure I keep writing in sprints of 30 minutes, then take a break. A quick glance to the side allows me to measure my progress and see how I’m doing. With that being said, I have personally seen visual timers just like the Time Timer Plus in several meetings and such. So even professionals use it to organize time. 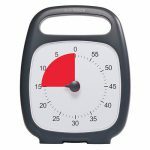 If you’re a teacher, then a Timer Timer is also great for you in order to organize tasks and time management in class! So, yes, the Time Timer Plus is an investment that can pay off in years to come! It’s not only for kids, it’s basically for ANYONE who wants to improve their time management. The Time Timer Plus certainly isn’t cheapest timer out there. Depending on which version (Time Timer offers them as 5-, 20-, 60- and 120-minute versions) and where you buy, prices can vary between $25 and $40. That’s quite expensive, right? But think about it this way: Each Time Timer has a bunch of moving parts: Besides the clockwork, there is the moving disc and the turn knob in the center. They all must be pivot-mounted fraction free. Finally, the plastic is high quality. The product is well made, and even though it is quite simple, it is worth the price the manufacturer asks for. I have seen a few alternative products to the Time Timer Plus on the market from lesser-known manufacturers. However, reviews of those “copied” products are not really convincing. It seems that there is something to it that is in favor of Time Timer, and the higher price seems to contribute to a better product quality. 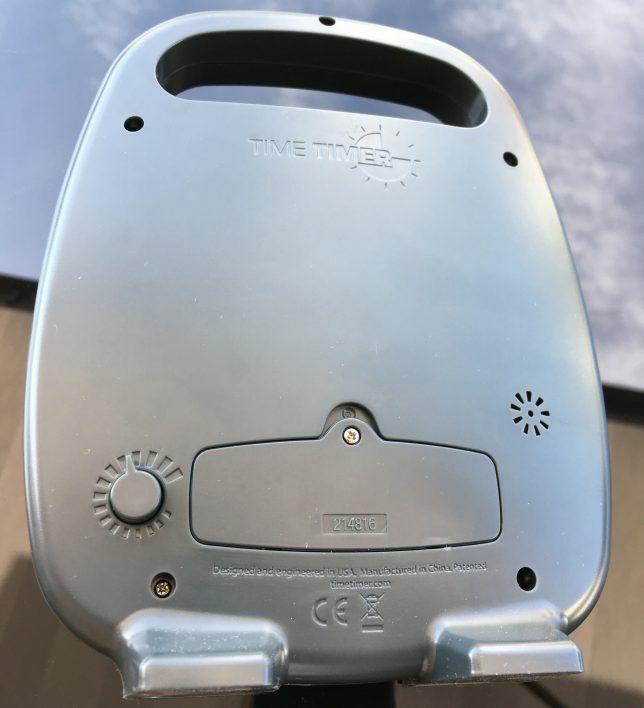 After all, I would definitely buy the Time Timer Plus again, and I would certainly favor it over similar products from other manufacturers out there. 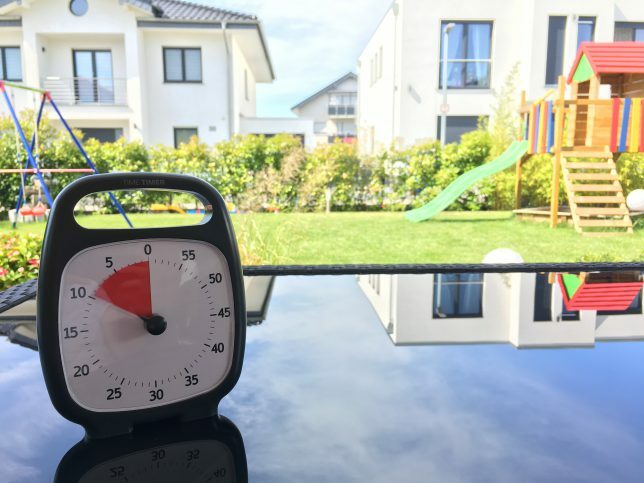 The Time Timer Plus is a great product and it has certainly made our family life a lot less stressful. Before we wrap this review up, let’s take a quick look at the pros and cons at the Time Timer Plus, so that you can make an educated buying decision for yourself, based on the hard truth. There are no loud ticking noises. The clockwork runs very silently. The price is a bit high. Yet, compared with other, similar products the quality is convincing and justifies the price tag. Even though it’s supposed to be a 60-minute timer, the Time Timer Plus stops at a maximum of 59 minutes. The timer comes without having a battery preinstalled. So make sure to have some 1.5 V AA batteries ready. If you’re like me and you prefer rechargeable batteries, I recommend getting Panasonic Eneloop batteries. Due to technical limitations, the Time Timer Plus 60 only allows a maximum of 59 minutes. 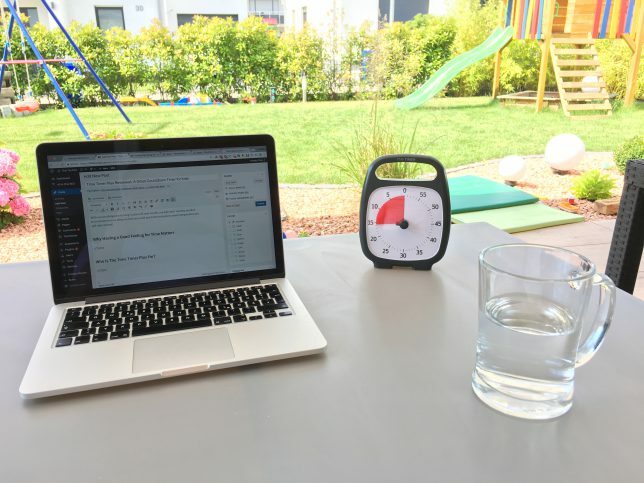 If you ever have any issues with your Time Timer Plus, the company has you covered: They are based in the United States and they offer a highly responsive E-Mail support on their website. If you have any problems with your device ever, just reach out and they are happy to help! The Timer Timer Plus certainly is a product that had a great impact on our family life. In a good way, obviously. Our son is just three years old, however, he already has a feeling for what I mean when I ask him to “wait for 30 minutes”. The clock helps him to keep track of the time, and he enjoys the new freedom that this new skill if you will, gives him. Before writing this review I told a bunch of friends about the Time Timer Plus and how well it worked for our family, and everybody was excited to get one and give it a try. I understand that the somewhat high price tag might drive people away to opt for cheaper products, but from my own experience and the reviews I’ve read about those cheaper products, I will say this: Buy such a timer cheap, and you’ll probably end up buying it twice. The Timer Timer Plus is totally worth it. And my son, as well as my wife and I, are looking forward to making good use of it for years to come. Give it a shot. You won’t regret it! What are your thoughts on the Time Timer Plus? What are your favorite tools to keep track of time? And what is your approach to teaching time management to your kids? If you have anything to add to this story, please leave a comment below or reach out to me via email. I am so looking forward to hearing from you. This is great, I love it. Like you, I have tried using my smart phone or iPad. I agree that the digital clock is not as good for children at all. They need to visually see the “count down”. I will be ordering this timer to give it a try. 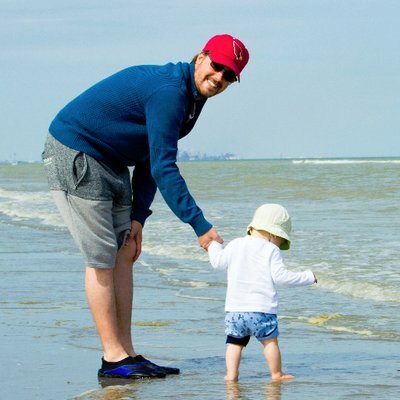 I have a two yr old and I loved your article about teaching your kid the concept of time. That timer looks like it gets the job done. I never really paid attention to how much time actually goes by while she watched tv and now I have come to the conclusion that it is far too long lol. I need to check out this timer, for my sake and for hers. Thank you for stopping by here and commenting on my article. I really appreciate that. Regarding screen time I’d say: Everything is fine as long as it works for you, your family and, most importantly, your kid, right? I’m not here to “teach”, I’m just trying to share my opinion and give advice from what I know works good for us. But I’m happy to hear that you like the idea of using the Time Timer. It will certainly help, especially now that you are trying to “introduce” this new screen time rule. What a great post, and a great Idea. I’ve never thought to do this with my children. No wonder we are always late and running out of time. Thanks for this great comment. Made my day 🙂 The timer is a great tool to keep track of time, however, it rarely saves us from being late. But if you ask my wife, that’s probably MY fault most of the time. I’m just gonna say: She’s probably right… Haha! My son is 2 and half and he is so curious with everything! Especially when I am trying to work here on this side of the screen. I love how interested he is and how he becomes so fascinated with the littlest of things. One thing I have noticed is how much time he is spending in front of a screen which is something I will be cautious about approaching . I want him to enjoy the outdoors as I did because there is so much to do around here. Love the idea of a countdown timer! what a great comment. You cannot imagine how well it resonates with me 🙂 I certainly feel your “pain”. Benni is the same. As soon as I turn on the computer, he’s highly interested. On the one hand that’s great, as I always try to encourage him to be curious and interested, on the other hand, I need to work every now and then and I obviously want to limit his screen time. On the topic of raising tech-savvy kids, by the way, I will release a new blog post tomorrow. Once it’s up, you’ll find it here! Wow! This would definitely come in handy with my Pre-Ballet students. The kids always want to know hong long the class is, and how much time is left. It’s a delicate situation because it’s important to teach them that it’s rude/disrespectful to ask what time it is during a dance class – at the same time, I understand why they are curious because they can’t tell time on their own yet. A visual tool like this will really help! Thank you so much for reading my review and commenting on it. And that’s a great use case, by the way! The Timer should definitely be large (and loud) enough for a dance studio. 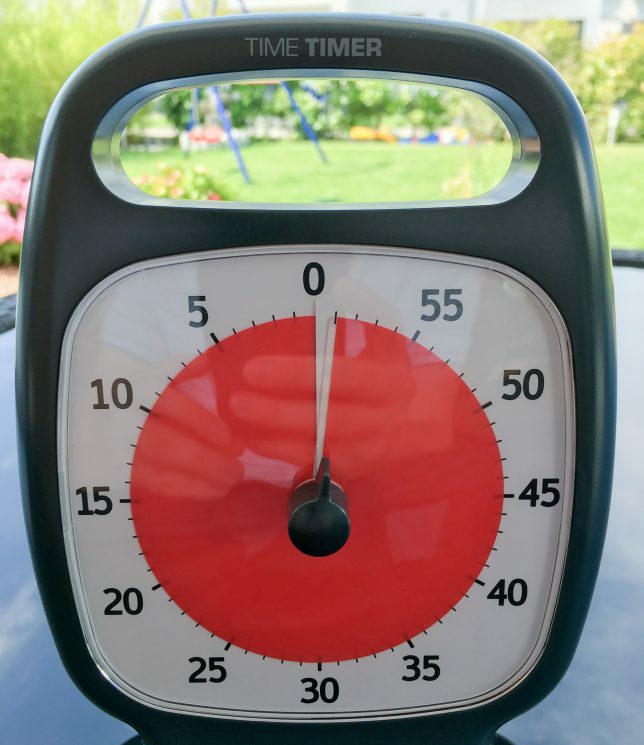 Just yesterday I saw that Bennis kindergarten teachers also use this timer for the entire kindergarten group, and if it works for them in their (often loud and somewhat hectic) environment, I believe that it will certainly work in your’s as well… Cool idea! Let me know how it works for you in case you purchase the timer and use it, will you? That would be awesome! Thanks Ronda! Glad you liked my article and thanks for your kind comment. All the best to you and your family! Hi Chris! Thank you so much for this article. I have to say that you are so correct when it comes to time management and kids. All of my kids are older now, but when they were young my husband and I would always tell them to sleep 30 more minutes or read a book when waking up at 6 am 🙂 Not that they understood 30 minutes, but they always went back to sleep after looking at books. I like this concept of teaching time to young children, as it is a very valuable skill to have, especially in this age of wanting everything right away. thank you for your kind comment. How lucky you were that your kids went back to sleep 🙂 Benni is so energized in the morning, there’s not even the slightest chance for him to get back to sleep! But with the timer in place, it gives all of us some time to have a relaxed start of the day.